It's pretty much business as usual for former Realtime Worlds lead character artist, Jimmy O'Ready, except now he's his own boss. Character designer O'Ready has wasted no time after the demise of APB, and has set up two new art companies in Dundee. The first is called Montynero Characters and the second is called Montynero Concept Art, and they're geared specifically towards providing high quality game art. O'Ready has worked on character design and customization for RTW and for EA, and says it's something that he enjoys doing. He also worked as a concept artist for years before transitioning to 3D and a management role. He said that he wanted to set his companies up in Dundee because it's a "great city" and "full of talent." 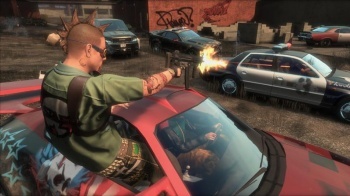 The character customization in APB was one of the few parts of the game that won praise from most quarters, and O'Ready thought that the work that he and his team did was a valuable asset for the game. He described the failure of APB as a "shock," and said that he thought delays in crucial areas had meant that the game had "missed its moment." Hopefully, O'Ready's newest venture will go a little more smoothly.